Step 1: Add the image that you want in the Resources folder in RapidWeaver. Step 2: Open up your snippets menu and click and drag “Canari – Banner or California – Banner” into the Pageinspector under header. Make sure that it says “image1″. 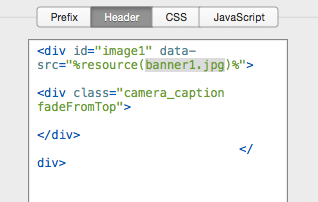 Step4: Replace “banner1.jpg“ with the name of the file that you want to use. To remove the caption just delete the div “fadeFromTop”. be sure to have a screen shot of the video to place as the banner image. Step 1. Paste the Included Extra Content Snippet (or copy and paste the code from below) into the main content or the sidebar content. for each Extra Content are you are using and select “Ignore Formatting” from the “Format” Drop down menu. (Or use keyboard shortcut Cmd . [period] )4. When you are done your editor content should look like the screenshot below. for every area you do not wish to use or else there will be blank space in those areas. Also the same goes for the Extra Content Stack. Insert all Extra Content areas that lead up to the one you want to use. Make sure to label them in the stacks editor as #1-#7. Step 1. Paste any of the included Social Media Snippets (or copy and paste code from below) into the main content or the sidebar content. Step 2. Replace “WEB-ADDRESS-HERE” text with address you want the icon to link to. The Icons will automatically appear in their place below the Main navigation menu. By default the Masonry Gallery is on. If you need to turn it on, click the “Page Info” button to bring up the Page Inspector. Click on the “Styles” tab & under “Masonry” select the on option that matches the width of your site (Site width option located at the top of the Styles list). The only thing you need to do is to turn the thumbnail size to large. To do this open the Page Inspector & click on the “Page” tab. Now click on the “General” button & move the “Thumbnail Size” slider all the way to the right. Refresh your page & the photos will no longer appear blurry. Step 1. To set up the Single Banner Option in Canari takes having the Single Banner Images Snippet.Step one the snippet into the Css within Page Inspector. Step 2. Replace “RESOURCE_NAME.jpg” with the name of the file that you want to showcase and that should be it. Step 1. 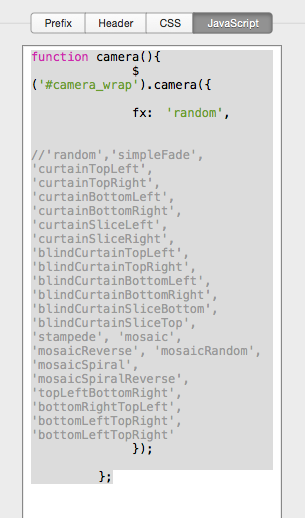 Start by installing the Canari – Banner Transition snippet. Step 3. Pick anyone of the types of captions and place it into the quotes in fx. 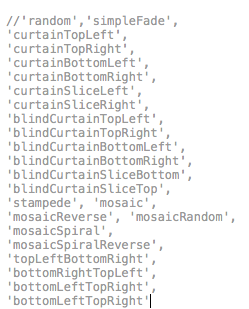 By default the snippet is set for random.